Hi friends. Are you busy getting ready for Thanksgiving? I think I have been to the Grocery store everyday for a week for something I have forgotten! Our daughter and son-in-law and two grands are coming for dinner. I have had up to 16 people in the past when my parents used to come before they passed and we always celebrated both Canadian Thanksgiving and American Thanksgiving here with my Godparents who lived in Toronto. I miss that big family dinner and all the activity in the house, but I am looking forward to cooking this year. Monday was our daughters birthday and today was my husband's birthday. I am sharing the card I made for my daughter here. it is easy to create with. than I think for dinner if the weather turns bad!! This is gorgeous Sue, Such a pretty and delicate design. Hi Sue, what a pretty elegant card. Your design is lovely. Sue, this is just lovely and sweet. Great idea to highlight the flowers. It gives them some nice depth. Simple and elegant. Wishing your daughter and hubby the best of birthdays. Oh, glad to hear that I am not the only one in the store on a daily basis. Wishing you A Fabulous Thanksgiving, no matter how many are at your table. what a elegant and gorgeous card Sue. WOW Sue!! 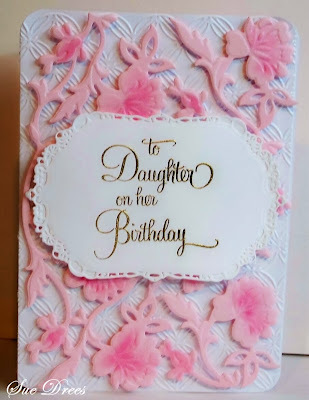 Your daughter must have just love this card!! STUNNING!!! Beautiful Sue, so pretty and elegant!